09:00 - 12:00 / Saturday – we are pleased to offer Saturday opening hours to you. For this special service, an additional fee in the amount of 250 RMB is charged. For more information, please refer to Added Value Services page. 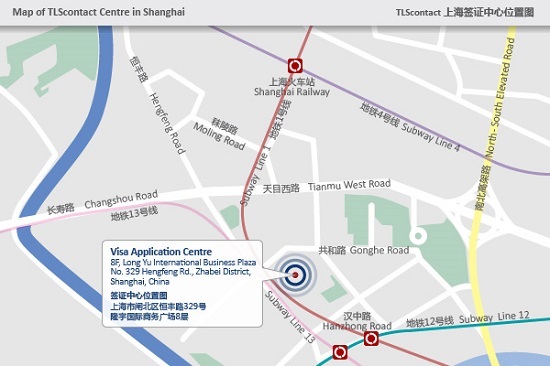 Line 1,12,13 Han Zhong Road station: Exit 1, go straight ahead for 100 meters on Min Li Road. The building is on the left side 3 minutes by walk. Bus lines no. 41, 64, 104, 109, 128, 741, 801, 845, 927, 955, 234, 301, 324 (at Hengfeng Road - Hanzhong Road station). From North to South: Arrive at the intersection of Heng Feng Road and Gong He Road, turn left and then turn right at first light to Min Li Road. Go straight ahead for 20 meters to the entrance of underground parking or building lobby on the right hand. From South to North: Arrive at the intersection of Heng Feng Road and Han Zhong Road, turn right and then left at first light to Min Li Road, go straight ahead for 50 meters till the entrance of underground parking or building lobby on the left hand.